“There’s no crying in threesomes!” Lonnie ‘MF’ Allen is brash yet contemplative. 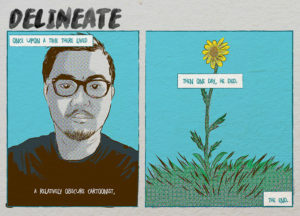 His comics speak to a confused, disenfranchised and lonely generation and they’re hilarious! 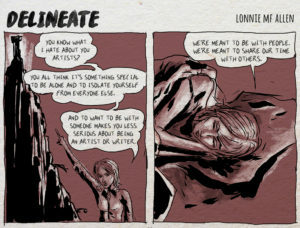 Delineate is a collection of strips that is very layered; he’s not afraid of big words and bigger meaning and it’s made all the better with his wonderful sense of color and texture.